Membership in the National Auto Sport Association will make you part of a large family of motorsports enthusiasts and will provide you many privileges. Digital subscription to Speed News, delivered to your inbox each month. Participate in more than 100 events across the country. Great discounts from specialized vendors. Opportunity to win great contingency prizes in our competition programs. 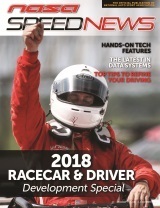 Miss an issue of Speed News? Catch up on all the issues!